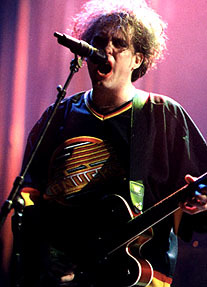 Isn't That Goth Brooks in the Canucks Jersey? Driving on the Georgia Viaduct en route to an evening with the Cure at the Q.E. Theatre, I was amazed at the contrast of concert-goers on both sides of the street: cowboys and cowgirls on their way to see Garth Brooks walking east, and the supreme goth of Vancouver heading west to pay homage to Robert Smith. This, I thought with growing anticipation, was going to be an interesting evening. As the show was advertised simply as "An evening with the Cure," I was left with a head full of questions just waiting to be answered. How long will they play? Is there an opening band? Will there be an intermission? Will there be a Q & A period? Will I get a chance to throw flowers on the stage in admiration?! All these questions were answered in full as Robert Smith and the rest of the Cure strolled out onto the stage and proceeded to give the full-capacity audience what was to be the best two and a half hours this city has seen in the longest time. 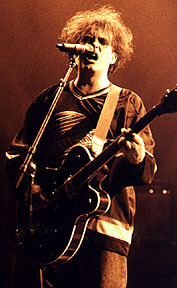 Robed in the away jersey of our beloved Vancouver Canucks (though I doubt he's a fan -- he wore Canadiens and Maple Leafs jerseys in Montreal and Toronto, respectively), Smith and associates opened the show in fine form with "Want" and "Club America" off their latest effort, Wild Mood Swings. Amidst a stage set up to look like a post apocalypse circus tent and a light show that would make the Northern Lights seem like a Grade 2 science project, the Cure moved the crowd into a stage of spiritual ecstasy that Oral Roberts himself would be jealous of. 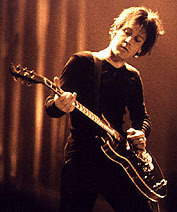 Over the hours the Cure graced us with their presence, they covered the full spectrum of their musical repertoire, including such classics as "Love Song," "Prayers for Rain," and "Let's Go to Bed." Not much for in-between numbers chatter, the Cure let their songs do the talking as each one was played superbly to its fullest potential, allowing the talents of new members Jason Cooper (drums) and Perry Bamonte (guitar) to be recognized, as well as welcoming keyboardist Roger O'Donnell back to the fold after a brief hiatus. 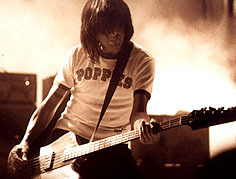 Rounding out the lineup was the always brilliant Simon Gallup on bass. My one and only complaint of the night was the audience reaction, a somewhat subdued and mild enjoyment of these amazingly executed songs. Apart from the occasional scream mid-song and sporadic dancing by a few brave souls, this was, as pointed out by a few of the faithful, a typical reaction to a Cure show. To each their own, I guess. It's often said by performers that they feed off the audience's energy. So, after the lack of energy I witnessed from the crowd, I didn't expect any encores after the Cure closed the show with my personal favourite, "Disintegration," but I was in for quite a surprise as they performed not one but three encores, including "Hot! Hot! Hot!" "Why Can't I Be You," and, to everyone's surprise and delight, "Love Cats." In finally leaving the stage with "Faith," a rare ditty indeed, the show ended in the same manner it started -- spectacularly! Everything was as close to perfect as possible, right down to the choice of venue. I was a bit skeptical at first as to how the Cure, a band who could have easily played the much larger GM Place, would carry this show in a venue the size of the Q.E. Theatre. In the end, however, I was convinced that this show wouldn't have been nearly as good anywhere else.